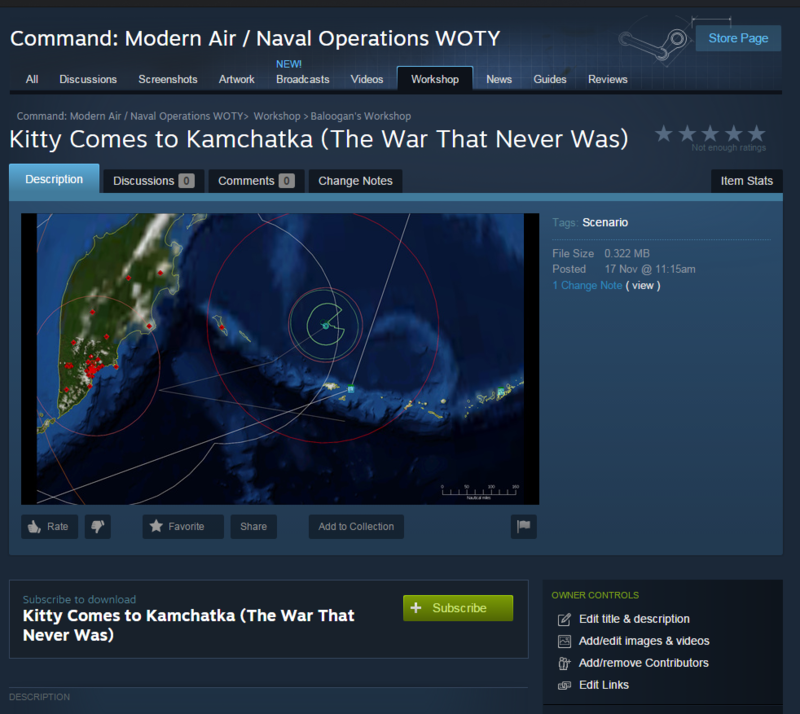 Command Modern Air / Naval Operations has been updated to Version 1.10! • MAJOR NEW ADDITION: Steam Workshop support. a custom image. Press "Publish New Item", and after a few seconds you should receive the notification that the upload was successful. 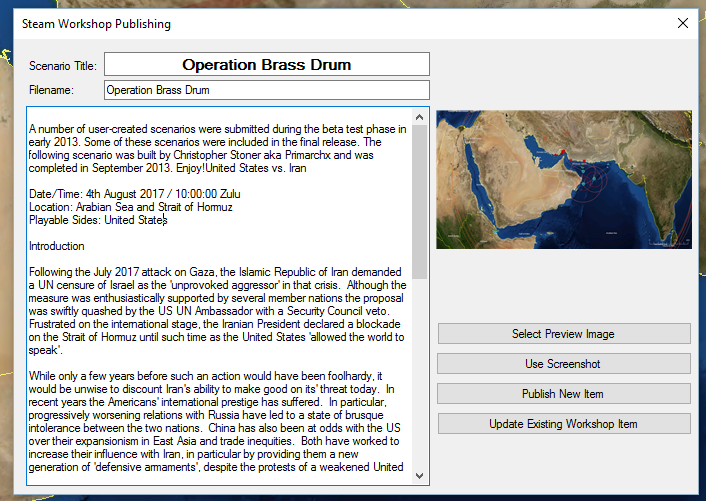 "Publish scenario to Steam Workshop". Change any of the text fields or the image if necessary, and click on "Update Existing Workshop Item". A new window will appear, listing all scenarios you have already uploaded. Select the scenario that corresponds to the update that you have made and click on "Upload". that exceeds the weapon range). 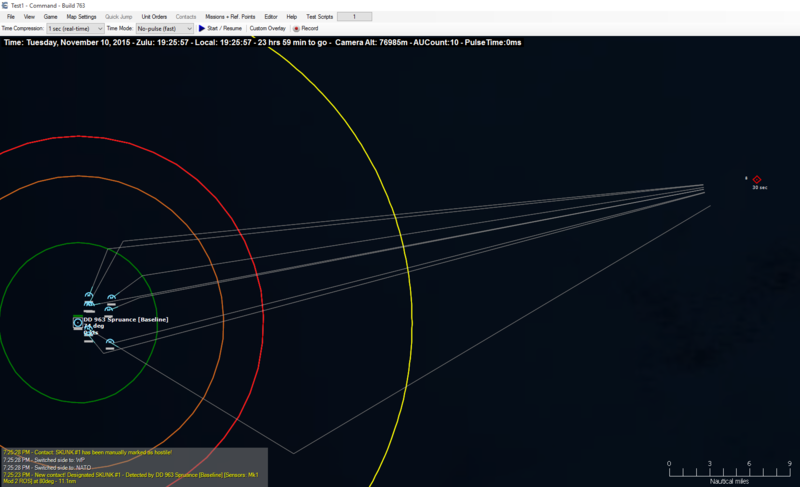 altitude and detonate over the aimpoint(s), maximizing the EMP effect. original power plan (if different from High Performance) is restored. under sub-sections) to make them easier to navigate. • New map display option: "Show mission area/course". Available choices are All, Selected (mission), and Do Not Show. displayed on the Throttle/Depth (F2) window. selecting one of group members. • NEW MAJOR FEATURE: Cooperative Engagement Capability (CEC). 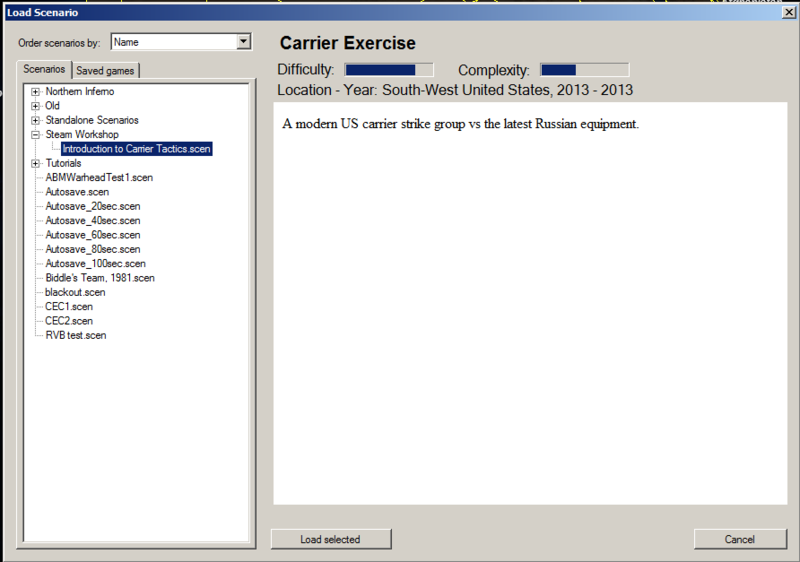 datalink parent to another ship or to an orbiting E-2D. mid-course updates from Bear-D MPA and Hormone-B helo. AGM-84E SLAM can switch datalink parent in-flight. • Tech generation is now taken into account for noise jamming (OECM). 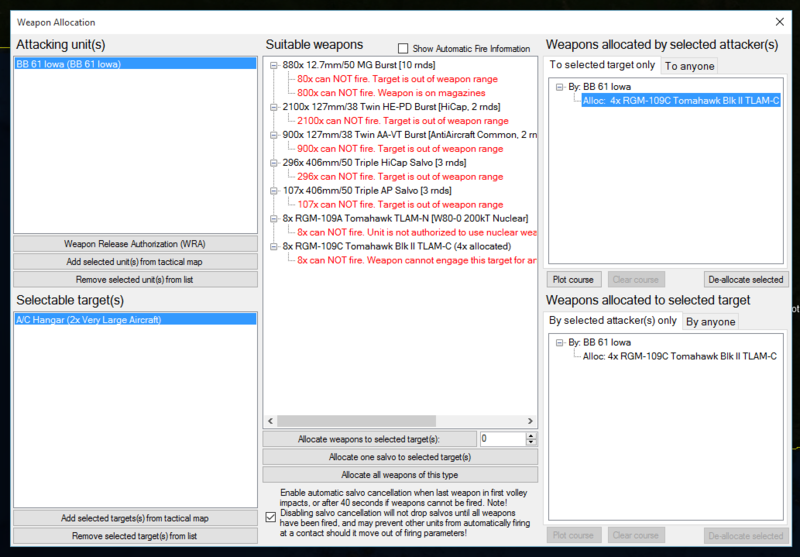 • New weapon feature: SAM/ABM warhead modifiers. probability of physically destroying the target missile or RV. suffers only a minor deviation (CEP increased by 1.5x). • A HTK warhead reliably destroys the target every time. from its intended aimpoint (this happened in a few instances in DS). weapon to use" calculations, as their warheads also make them more lethal on anti-aircraft engagements. TDC could do it in WW2...). direct hit. (It also makes it more imperative to control the "open fire"
while they are still in transit. rebuilt in order to feature this. number of calls, ie. "you may request this 3 times"). From a technical standpoint, Special Actions act as containers for Lua scripts so they can be very powerful. encouraged to be elaborate in their explanations. "Magazines" window and click on the "Add Magazine" button. 'snatched' either from mid-air or from its current host. compatibility, the default level is “Detected – Known Domain”. 0008917 [Lua] Add aircraft to airbase / add boats to motherships. report as NA in these cases. FIXED: Unable to classify very quiet sonar contacts. FIXED: Subs ignore patrol transit/station depth overrides. sonobuoys deployed at sea etc. #10186 - [B757.12] - afterburner crash? Add facility 2766 Arty Bty (122mm/38 D-30 2A-18 Towed Howitzer). FIXED: "Rigid tether" with Remus 600 and other tethered ROVs. TWEAK: Grouped all unit-related operations on ScenEdit menu under "Unit Ops"
Are the manuals updated when a new version is released? The printed manual is not updated, but the Manual Addendum pages are.